It’s a marvelous feeling to see my body changing and improving day by day. I have progressed so much already even though the scale isn’t necessarily much lower than I’d hope, I can actually see improvements in my body and by what I’m accomplishing in the gym. My motivation is higher than ever and I absolutely love getting in shape. 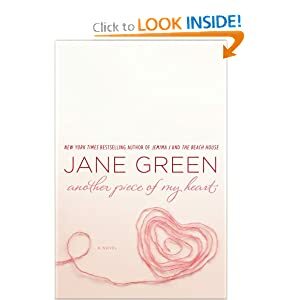 “Another Piece of My Heart” by Jane Green was an awesome book. I was unsure if I should read it because it seemed like something that wouldn’t necessarily interest me. I am only 22 and I tend to stay to books that have characters around my age or a little older, just because I can relate easier (there have been exceptions of course). This was another exception to my comfort-level and I am so glad I made this choice. The book is very engaging, it is extremely complex and it really made me feel like I was there with the characters, experiencing everything with them – I felt very connected to the characters and I felt like I was watching a TV series. Not a movie, a TV series – because there i a lot of stuff going on in this book to fit in one movie. The only thing I wasn’t too crazy about was the constant sudden change of voice and perspective of the narrator – sometimes it’s this person talking, sometimes it’s someone else, sometimes it’s an all-knowing 3rd person narrator. It can get a little confusing at times but that might have been what really connected me to the book and made me feel like I knew the story from all the different perspectives. From the New York Times bestselling author of JEMIMA J, and THE BEACH HOUSE, comes Jane Green’s most emotional and powerful novel yet: a story that explores the complications of a woman marrying into a ready-made family, and the true meaning of motherhood. ANOTHER PIECE OF MY HEART is a novel that illuminates the nuances and truths about relationships and is Jane Green at her absolute best. I will gladly give this book a rating of 5 out of 5 stars. It’s a much recommended and marvelous read. Another point I want to make today is that it’s marvelous how health conscious business are becoming and that there is an increasing number of healthy lunch spots popping up all over the place. 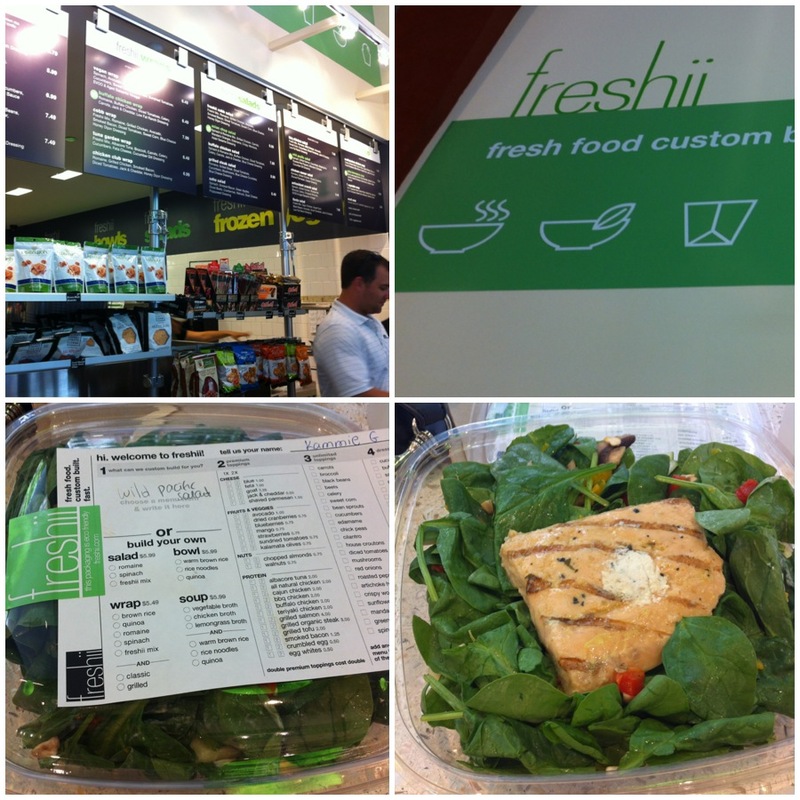 Last week, my co-workers and I made a lunch trip out to Freshii. After checking out their website and drooling, we decided we had to finally make the trip. Although I can’t say I was exactly overjoyed with the place – it was expensive and the food was pretty bland, we all agreed on the boring bland taste factor. I tried the Wild Pacific Salmon salad which was pretty dry and boring; my friends had a rice bowl and a noodle bowl, both of which they said they could have easily made themselves and it wasn’t anything to write home about, it was actually rather disappointing. I realized that it might be a better idea to just create your own salad/bowl when you go there because they offer a vast numer of unlimited veggie toppings, many of which I was interested in. If we make our way out there again, I will make sure to create my own salad and base my opinion off of that trip as well. Everyone deserves a second chance! Another marvelous event was Pamper Me Fabulous yesterday. I did a review of KLUTCHclub box in June, a subscription fitness-focused monthly box, and they had me down as one of their members in their database. They sent me an email inviting me to attend this event for free (normally the price is $42) as a thanks for supporting them and living in Chicago. The email was sent to all Chicago members. Since I had no previous plans for Sunday, I RSVP’ed and decided to go (alone, dun dun dun, I know, I’m such a loser..) I came pretty late and didn’t stay long. I did manage to squeeze in their 20min hatha yoga session which was perfectly relaxing. It took place in a marvelous art studio with different art pieces hanging on the walls. I sampled some cocktails by Godiva and Qream and wow, so so so good. Probably caloric as heck too though. 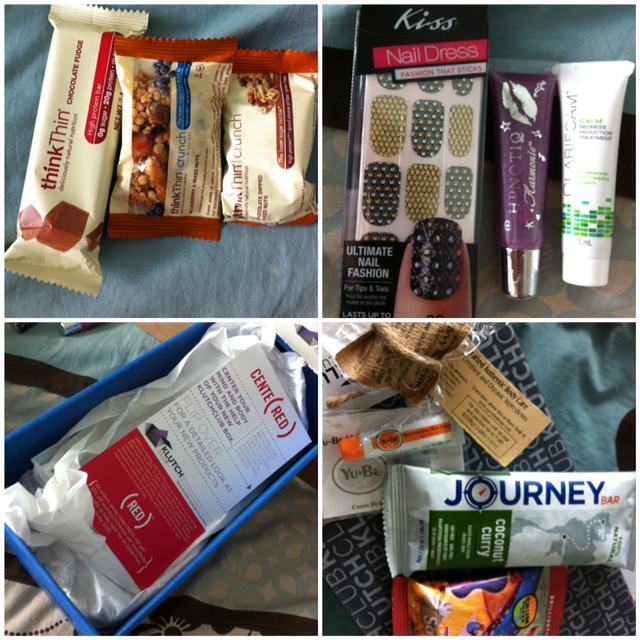 Then i got some free samples of Think Thin bars and my gift bag. I doubt I would have come if I had to pay- you had to pay for everything in there again so I’d personally rather just go to Macy’s or Nordstrom to get the same kind of deals on skin products. congrats on accomplishing your fitness goals! 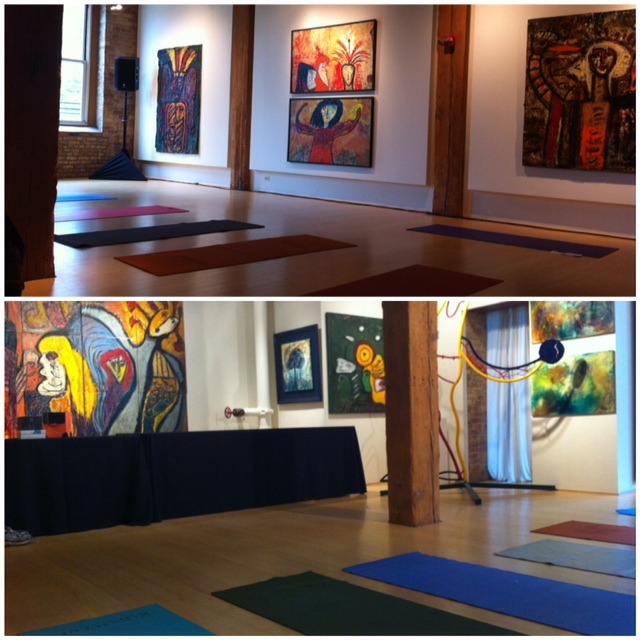 That is one of the coolest yoga studios I have ever seen! I love the art everywhere! Think Thin bars are so yummy! And the number on the scale is so irrelevant – muscle weighs more than fat and you look fabulous! So proud that you are working towards getting fitter and not just focusing on the scale! I think that is key to reaching true healthy 🙂 I agree with you too it is so great to see healthier places popping up everywhere! I actually love it when restaurants post calories too! Definitely a step in the right direction! Omg yes, I LOVE when they post calories. It’s important and we need to be aware of how much we’re eating. I have never taken a pilates class. I love doing pilates here at home, but that outdoor class sounds so fun! That book sounds interesting- I’ll have to check it out! You look super fit and Chicago looks like such a beautiful city. I love your blog! I couldn’t agree more – it makes me incredibly happy to see society in general becoming much more sensitive and accommodating to people’s differing (and healthier!) diets. I’ve wanted to try Freshii for a while already…your meal there looks great! 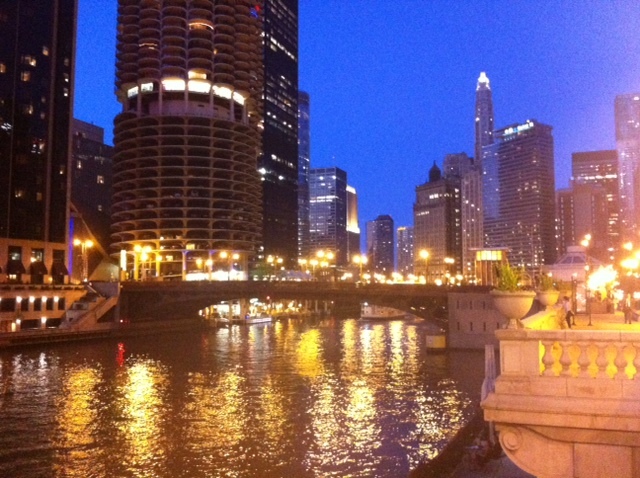 And Chicago really is a beautiful city. I’ve lived here for almost my entire life and the sights/skyline NEVER get old.